The visit will start with the Louvre. You must collect your Louvre ticket at PARISCityVISION agency showing up there 30 minutes prior the time indicated. This pass means you can combine visiting Paris and visiting one of the world’s greatest museums, the Louvre. You will enjoy a two-day pass for the open-top Big Bus and a ticket for a sightseeing cruise along the Seine. You choose the date and time of your visit to the Louvre. Enjoy priority access to get inside the museum easily. At your own pace, you can wander through the various galleries housing a multitude of great artistic works across a wide spectrum. A former Palais Royal, the Louvre is today one of the world’s most popular museums. You can see famous artworks such as Leonard da Vinci’s Mona Lisa, The Coronation of Napoleon, Marriage at Cana and Winged Victory at Samothrace. The ticket gives you access to many rooms, so you can look at the artworks that most appeal to you. 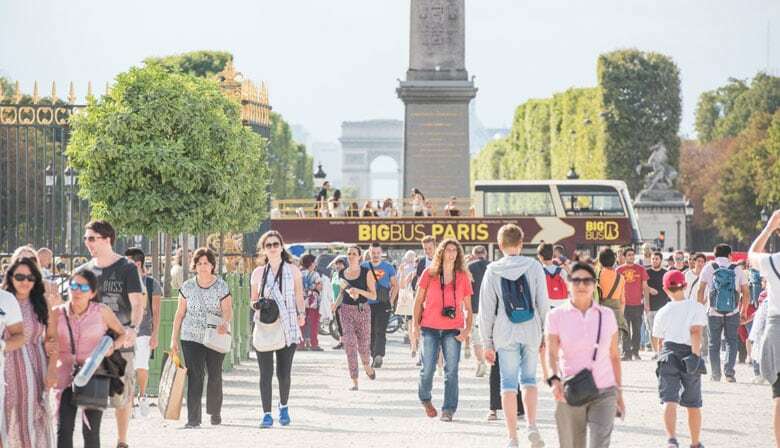 You can continue your visit to Paris by taking the Big Bus on two consecutive days, giving a unique panoramic view of Paris. Two routes are available to enable you to see the capital’s iconic major monuments. You can hop on and hop off at any point, at the different stops spread across the center and Montmartre district. So you can wander through the streets of Paris, discover the city's leading districts, admire the beauty of the City of Light, cross the many superb bridges along the Seine. The red route gives a glimpse of the famous Parisian monuments in the city center. So you can see the Louvre, the famous Champs Elysées, Invalides, Notre-Dame de Paris and the Eiffel Tower. Buses run every 5 minutes in the summer / every 15 minutes in the winter. The blue route will take you across the Bohemian district of Montmartre. You will pass the legendary Parisian cabaret, Moulin Rouge, and go up to the top of the hill. There are stops so you can hop off to visit the superb Sacré Cœur basilica, discover la place du Tertre with its portrait painters and cartoonists, wander through the picturesque and charming streets of Montmartre. Buses run every 30 minutes. You will also have a sightseeing cruise ticket, valid for a year, that enables you to take a guided tour down the Seine, at a time of your choosing. Leaving from the foot of the Eiffel Tower, you will visit Paris in an original way, while listening to commentary in the language of your choice through individual headsets. You can discover the history of Paris and its monuments that line the Seine, you also see sites recognizable by their architecture or their stature in the sky, such as the Arc de Triomphe, Invalides, Sacré-Cœur and the Louvre. You can also admire the bridges that are an integral part of the history and charm of Paris. Big Bus: Once you have booked, you'll receive an e-ticket by email which you can then print out or present directly on your smartphone. The e-ticket can be redeemed directly on the bus. The day on which it is redeemed counts as the first day of use of the pass.